A new year, new plans. In the second half of February 2014 I will travel in Ukraine again – to places that are familiar to me and others that are unknown territory yet. Do you have recommendations? The list of possible destinations was long, now I’ve shrunk it to a realistic level. And yet, 10 destinations in 10 days, looks much. I will see what can be handled when one depends on public transportation in a severe Ukrainian winter. Lviv and Chernivtsi are important reference points for the planned trip – places from where day trips can be managed. Another such starting point could be Ternopil. Since August 2012, I have photographed synagogues and Jewish cemetries in Galicia and Bukovina – spots that are left from the rich Jewish heritage there. The trip in February will add some more aspects. In the fall of 2014, the pictures will be shown in at least two exhibitions in Germany – during the Jewish Culture Week in Frankfurt and during the “Photokina” photo fair in Cologne. While making these plans, I also think of my Ukrainian friends. Most of them protest since weeks for a better future. My thoughts and wishes are with them! I wish all of you a happy new year 2014! 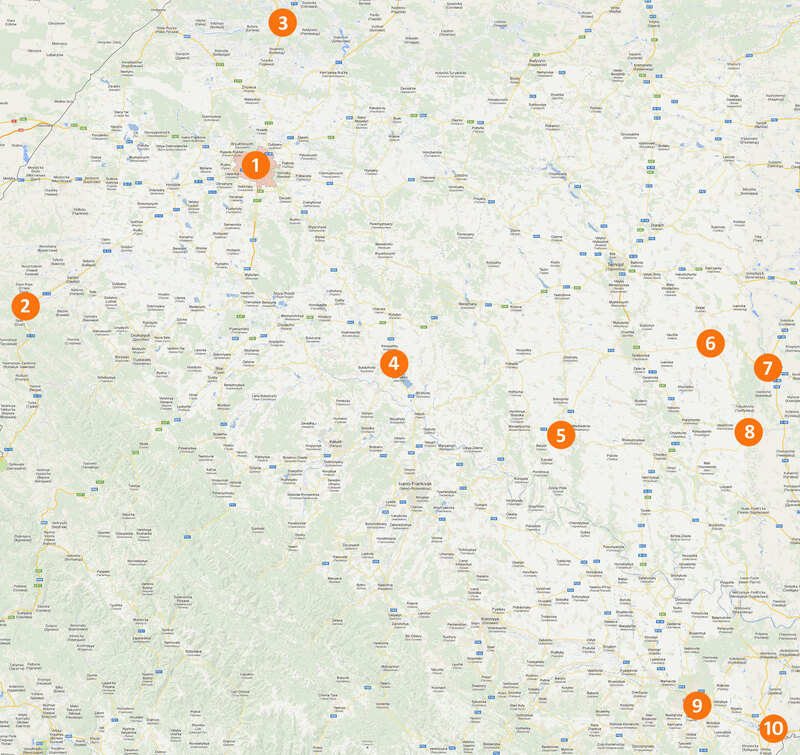 This entry was tagged Buchach, Burshtyn, Chernivtsi (Czernowitz), Hrymailiv, Husiatyn, Lviv (Lwow Lemberg), Novoselitsa, Sataniv, Staryi Sambir, Velyki Mosty. Bookmark the permalink. I visited Nowa Selitza about 3 years ago. Right off the rynek there is a building that had been a synagogue that had awesome murals. I am afraid it was scheduled to be demolished. If you wish contact me and I can tell you more about it. I found pictures of this beautiful synagogue and paintings. are you sure it will be demolished? What kind of information could you find in Nowa Selitza about the former jewish community? My grandfather Nahman Barak was born there 1890. Are you french? Then you can answer in French. To my best knowledge there is nothing that indicates the synagogue would be demolished. http://czernowitz.ehpes.com/ is the best source for Bukovinian Jewish history. Feel free to join the mailing list and ask your questions! I can also tell you about Sataniv, perhaps the most haunting Jewish site in the Ukrayne!